For Australia's estimated 650,000 trailer boats, that dull grey appendage - their boat trailer - underneath their pride 'n joy, is never high on their list of 'need to know' info or research priorities, until (a) the wheels actually come off (b) they get knocked back by the increasingly tough trailer Registration inspectors (c) they can't get the boat off the trailer without a tractor, or (d) all of the above! Peter Webster's latest, completely revised, updated and re-edited (from September 2014) edition of Trailers, Towing & Rooftopping, is the only book of its kind. The book has 140 pages of tips, bits, gear advice, techniques - even how to completely restore a stuffed trailer to pass Rego. Download once - and keep forever! This edition has been re-designed for tablet, smart phone and computer reading in our renowned PDF protocols, which make reading, using and revisiting the book a delight. 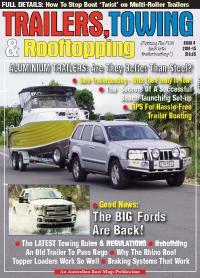 Description: A 140 page guide to everything about boat trailers you'll ever need to know!